I love this book. I read it a couple of years ago. Very inspiring. It made me cry. The Columbine tragedy in April 1999 pierced the heart of our country. We later learned that the teenage killers specifically targeted Rachel Scott and mocked her Christian faith on their chilling, homemade videotapes. Rachel Scott died for her faith. Now her parents talk about Rachel’s life and how they have found meaning in their daughter’s martyrdom in the aftermath of the school shooting. 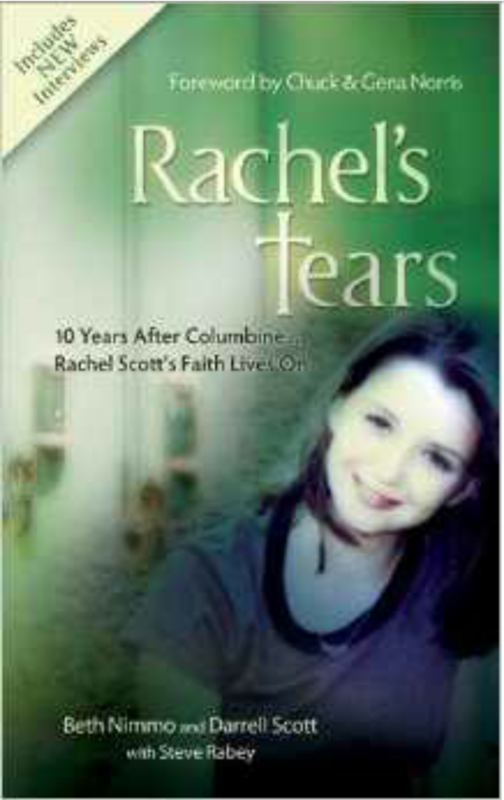 Rachel’s Tears comes from a heartfelt need to celebrate this young girl’s life, to work through the grief and the questions of a nation, and to comfort those who have been touched by violence in our schools today. Using excerpts and drawings from Rachel’s own journals, her parents offer a spiritual perspective on the Columbine tragedy and provide a vision of hope for preventing youth violence across the nation.